As the trending view, that the government should fix all, continues to expand in the United States, a frightening step that can only be called Nazi healthcare has emerged in New York City under the socialist mayor Bill de Blasio. You see in the ultra-Orthodox Jewish communities in Brooklyn there has been an outbreak of measles. This is because the community is against measle vaccines. There may be a justification for this. There are suspicions that the measles vaccine causes autism and other health problems. I hold no opinion. At the same time, the chances of dying from measles is minimal. In the late 1950s in the United States, it was probably close to 1 in 10,000. I had measles as a child and so did all my friends. It was no big deal and a break from being sent to child day prison--school. But, as we know, lefties are not deep thinkers. They do not analyze and compare. They are knee jerk reactors to situations and do not think about options or second and third stage consequences. And when they get something in their head, they want to make it mandatory for all. I have already reported on the hip $560 per hour hip San Francisco doctor who is in favor of the measle vaccine. He said, "I will admit to you that sometimes I talk about things I don't know a lot about but I have carefully studied vaccinations." He then went on to make the absurd claim that "5% of children who caught measles died." 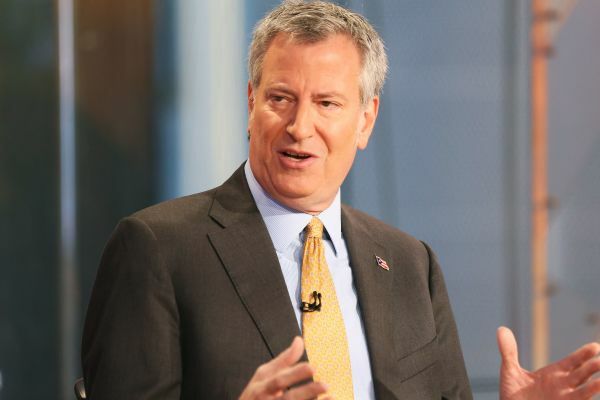 From what I have seen and heard from Mayor de Blasio, he is even more of a brain-freeze power freak and it is on display now after the measles outbreak. de Blasio has declared a public health emergency that would require unvaccinated individuals living in Williamsburg and Brooklyn to receive the measles vaccine. The mayor said the city would issue violations and possibly fines of $1,000 for those who did not comply. So speaks the statist who thinks he knows better than everyone living in Williamsburg and Brooklyn. It should be noted his degrees are in politics, not medicine. But this is the way central planning power freaks operate, they make decisions for all backed up by the power of the gun. They hate freedom. It is, ultimately, their way or death. They are very dangerous people. Much more dangerous than measles. The whole show is great, but if you want to see a segment on the studies relied upon to claim that the MMR vaccine is "safe and effective". Also look up healthy people 2020 and learn about how vaccines will be forced upon you. Soon you'll have to get your boosters to renew your drivers license or passport. If you're pro-freedom you can't ignore this issue. I forgot to add that the segment on the safety studies starts around the 48 minute mark. Can I get a vaccination somewhere to protect against Statism and Collectivism? But I guess that sort of vaccination is the simple act of firearms ownership. The question is, can you afford not to have your child subjected to tyrannical healthcare?